Ever since one of the owners of Gourmet Shish Kebab (GSK) was in the news pleading guilty to spying for Iraq, I couldn’t in good conscience continue to eat there. Due to the quality of the food however, it continues to be my basis for comparison when it comes to kabobs. Enter Maiwand Kabob, a small chain of three restaurants in Columbia, Burtonsville, and Hanover that serves Afghan-style kabobs. My roommate goes to the Columbia location fairly often and recommended it, so the other night we headed to the new location in Hanover to check it out. Right next to Arundel Preserve at Arundel Mills, it’s easy to find. The food at Maiwand is cooked to order. Once you order your meal, you will have a few minutes to sit down and take in your surroundings. The restaurant aesthetic blends slightly industrial yet modern decor with more traditional styles. There is fast-food style seating for 20-30 people, with most tables seating four and a few round tables suitable for 5-6 people. There are high ceilings with exposed air ducts and wiring, clay colored floor tiles, dark wood grain tables, and hand-painted frescoes depicting scenes from Afghanistan on the earthy-toned walls. 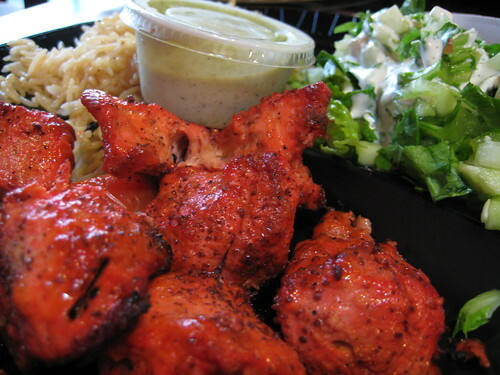 The Chicken Kabob platter includes 6-7 large chunks of boneless chicken, marinated in a red tandoori spice mixture. I’m told that the coloring varies, sometimes it’s more of an orange color. More tumeric, perhaps? In any case, the spices still remain on the skin after its cooked. The chicken was tender and most, but not so loose that it was falling apart. There was no need to apply additional hot sauce, salt/pepper, or the provided seasonings. Very good. Also included in the platter is a green/cucumber salad with yogurt dressing, grilled onions and tomato, a heap of long grain rice, a cup of cucumber-infused dressing that’s great for dipping, and a 10-inch circle-shaped piece of tandoori bread. All of the sides were well prepared and fully complemented the meal. Alas, the bread wasn’t as good as the nan at GSK. It wasn’t as soft and was a bit crispy around the edges. There will definitely be a next time. They have Aushak: ravioli filled with scallions, served with yogurt, mint and garlic, topped with ground beef. Their Samosas looked good too: fried pastries filled with potatoes, green peas and spices. I definitely plan to give them a try. Pricing here is a dollar or two more than at Columbia. 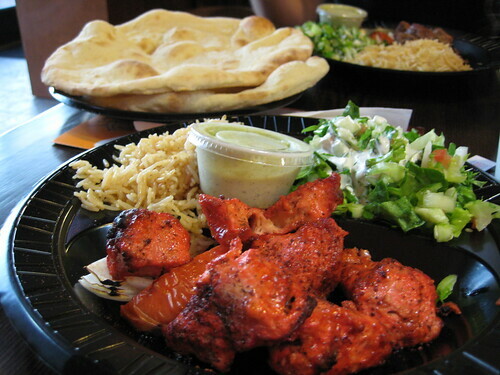 The Chicken Kabob platter is $9. That being said, this is a lot of food. It doesn’t look like it, but if you finish your plate you’ll soon learn as I did that appearances can be very deceiving. Dude, Maiwand Kabob is the best! I’ve been meaning to stop in the location near Arundel Mills. I’ll check this one out for sure. they have another location in BWI parkway in linthicum.I always go to that one but omg I swear to god this has got to be the best kabobs in MARYLANd hands down! the juice of the meat just drips when u are eating it u can tell everything is fresh because it takes about 15-20 minutes and they are always busy which is a good thing.. They also have one off of West Nursery Rd, by BWI airport!!! I go there for lunch alllllll the time, but I live by the Columbia location, I must agree, they are King of Kabobs! The Arundel location is so much brighter and bigger than the Columbia store.